Despite my complete inability to follow the directions with this recipe, it still turned out pretty well. It wasn't until I was typing up the recipe (AFTER we'd eaten it), that I remembered I was supposed to drizzle the finished product with balsamic vinegar. Then, I realized I had forgotten to scrape out the squash flesh and add it to the barley mixture before its final bake. Double oops. The balsamic would have been an awesome addition, but the squash mishap wasn't a big deal. We simply scraped out the squash along with the barley as we dug in. Our grocery store only had one acorn squash left so I halved the recipe and we were both a little disappointed that there weren't leftovers for the following day. This was my first experience cooking with fennel. I've had it in a few restaurant dishes, so I knew what to expect, but I found the flavor very pronounced in this recipe. If you stringently hate the taste of black licorice you might want to find something else to stuff in the squash. I was a little worried the strong flavor would turn Ryan off but he only had compliments for this recipe. Another America's Test Kitchen Cookbook success (I have yet to find a failure)! 1. Preheat the oven to 400F. Line a rimmed baking sheet with foil and spray with cooking spray. Brush cut sides of the acorn squash halves with 1 tsp olive oil and season with salt and pepper. Place cut side down on the prepared baking sheet. Roast for 45-55 minutes, until tender. 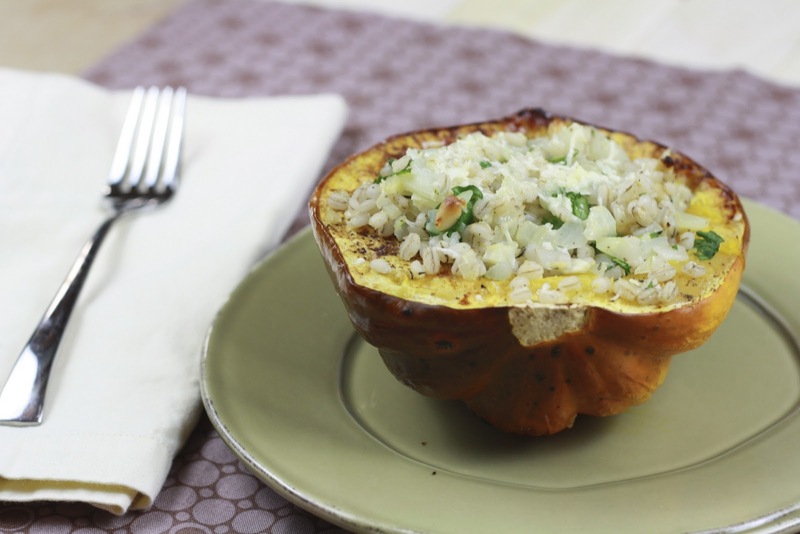 Once squash is finished, remove from oven and increase the oven temperature to 450F. 2. While squash is roasting, bring 3 quarts of water to a boil in a large saucepan. Add barley and 1/4 tsp salt. Return to a boil and reduce heat to a simmer. Cook barley for 20-25 minutes, until tender. Drain and set aside. 3. Wipe the barley saucepan dry and add 1 tsp oil, onion, and fennel. Cover and cook over medium-low heat, stirring occasionally, until vegetables are softened (8-10 minutes). Add garlic, thyme, and coriander and cook for 30 seconds. 4. Remove mixture from heat and stir in barley, 3/4 cup of Parmesan, parsley, pine nuts, and butter. Season with salt and pepper. 5. Place squash cut side up on the baking sheet and scoop out squash flesh (leave about a 1/2 inch thickness in each shell). Fold squash into barley mixture and fill each empty squash half with the mixture (about 1 cup of filling for each). Sprinkle with remaining Parmesan and bake for 5-10 minutes, until cheese melts. Drizzle with balsamic vinegar just before serving.